Emilyke: Top ten under £10! So today i'm writing this on my new laptop, yippee! I love it and have been stuck to it whenever i'm at home, trying to get the hang of Windows 8! 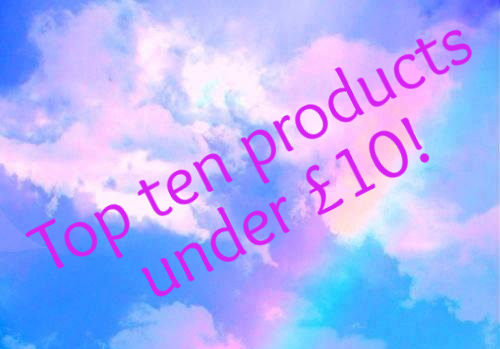 So hopefully i'll be posting more often now I have my very own snazzy new laptop :) I've put together my top ten products for under £10 which are all pretty good quality for the price they cost! MUA eyeshadow palettes £4 - These palettes contain 12 eyeshadows each and are such amazing quality considering the tiny price they are! I've listed the 'Heaven and earth' palette which is my personal favourite but they are all full of great varieties of shades. Rimmel Stay Matte powder £3.99 - A favourite amongst beauty bloggers and often preferred to the likes of much higher end brands such as Mac. This is the perfect powder for me, it takes away shine without making you look too powdery and cakey. GOSH bronzing pearls £8.99 - I have used this bronzer for years and whilst i've tried loads of other bronzers, powders and pearls, I always come back to this same one. It's not too harsh so I can build it up to however dark I want it, it doesn't make me at all orange and just gives a nice 'bronzed' glow. Natural Collection LashBuild mascara £1.99 - Again, this is a product i've used for years and still love. This is one of my favourite mascaras, alongside Colossal, but a whole lot cheaper. It doesn't clump my lashes at all or leave black smudgey marks above my eyes, I literally have no problems with this. It lengthens, lets me build as much volume as I want and still leaves my lashes separated. Rimmel Kate Moss lipsticks £5.49 - Another favourite on the blogging scene, these lipsticks seem much higher quality than their price tag would suggest. The shades I own all have great pigmentation, don't dry out my lips not even the matte ones and last a good few hours, with just the need for a slight top up after eating. Collection Lasting Perfection concealer £4.19 - Hello holy grail product of the century! Everyone seems to own this concealer and if you don't, why ever not! I use this everyday for an under eye concealer and it covers dark circles and brightens up the area perfectly. To be honest, I don't find it too helpful at covering blemishes, but that's not what I use it for so this doesn't bother me! Garnier BB cream £9.99 - Okay so only just under the £10 mark, but this deserves its place. I've tried a fair few BB creams and hated them all, but after hearing good things about this I gave it a go and I love it! Basically it does everything it says on the box with the only downside being that it leaves me a bit shiny, but whack on a bit of powder and hey presto! Dainty doll blusher 'You are my sunshine' £1.99 - I got this a while ago when everyone went mad for all the Dainty doll products on Fragrance Direct for £1.99. This might be cheating slightly because I think its originally £11/12 but I got it a lot cheaper than that and i'm sure there is still some £1.99 products on there. This is THE perfect blusher colour, a gorgeous pink with hints of gold for a nice glow and I wear this literally every day at the moment. Palmers Cocoa Butter lip balm £1.26 - I've always had a bit of a problem with lip balms, I swear most of them moisturise for the short while they're on my lips and then my lips end up even dryer afterwards.. However this is the complete opposite and leaves my lips perfectly hydrated, I never have dry lips anymore *touch wood*. Also, this seems to make my lips actually look nice, I know it's just clear but I swear my lips look so much nicer with this on, there's some magic going on in this tube okay. MUA Power Pouts £3 - I bought two of these as they were on offer for £4 for two so I thought I would give them a go and i'm glad I did. They glide on so easily, are really well pigmented and are just a really nice texture. I feel like I have nothing on my lips when i'm wearing these and they're just a pleasurable product to wear. They don't have the bestttt staying power, but I can forget that when the rest is so good. 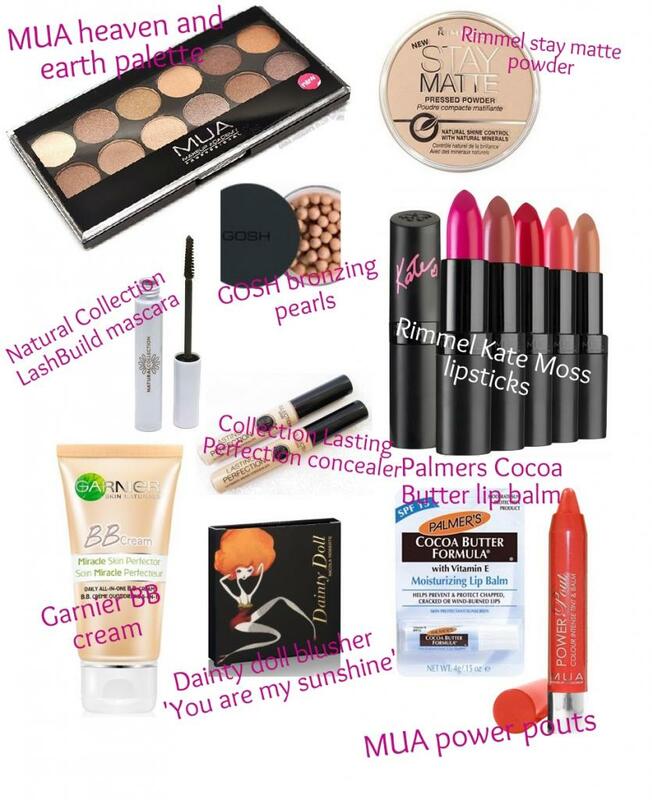 So that is my ten favourite products for less than ten pounds! I really thought about this and all the products I chose are honestly great products in my eyes and many of them I use on a daily basis, so if you're thinking about trying any of these, go for it! What is your favourite product under £10? Love all of these products! Definitely going to be checking out the dainty doll products!